Most of us have a very strong attachment with our cars. We treat them like our significant others (some even treat their cars more than they treat their significant others), and we spend countless of hours washing them to make them squeaky clean. Car washing can even be therapeutic to some. Washing and waxing their prized possession offers a relief from stress and anxiety. It's an exercise that they find not only beneficial to their body but to their mind as well. Some would rather wash and scrub every inch of their car than go out and grab a beer (not me!). Whether you're a devoted-car lover or just simply want your car to look clean and presentable every time, having the best car care cleaning cloth is a must, and there's no better choice than MAXI WIPES! 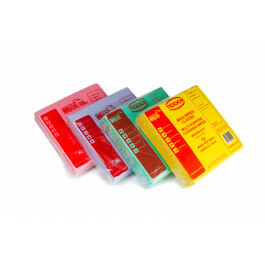 MAXI WIPES are super absorbent car care cleaning cloths for washing, soaking and drying cars. It’s thick pile softness won't scratch the surfaces and the high viscose content will soak up over 8 times its own weight in liquids! This sponge action car care cloth is ideal for washing down cars and you won’t be disappointed with the result it provides. Not only is it a high-absorbent cloth, it is also a very economical choice as it can be used and reused several times. Squeeze, Rinse, Reuse! MAXI WIPES offer car care lovers best value for your money when it comes to car wash cloths. Available in a range of different colours, in handy packs of 38cm x 38cm cloths, these packs of wipes can easily pop inside your car glove box or boot and be conveniently used anywhere. Furthermore, the various colours allow different care care tasks to be allocated to different coloured cloths. For example, allocate a different coloured cloth to wheel cleaning jobs, so as to keep that cloth separate from the MAXI WIPE used to clean the car interior. Clean your car like a pro with MAXI WIPES and enjoy a professional finish both inside and outside! Other related products from TIDDOX 's range of car care cleaning cloths include the MAXI WIPES PREMIUM , the LOW LINT INDUSTRO WIPES, and the GIANT CAR WASH SHAMMY.